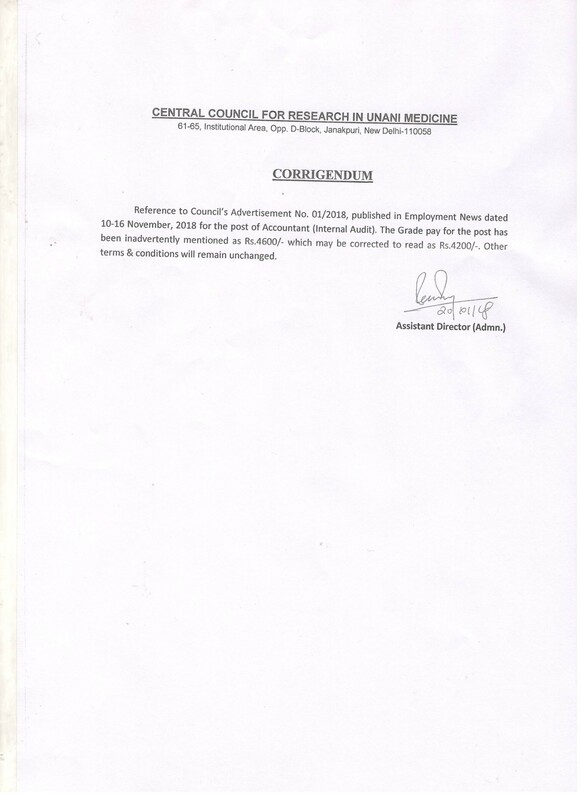 Walk-in-Interview for the post of Programme Assistant under (Pharmacovigilance Programme), New Delhi Advertisement for the post of Research Associates (Unani) & Junior Research Fellow (Unani) at Bhopal WRITOSKILL- 2019 Tender for printing, publishing and online management of Hippocratic Journal of Unani Medicine AYUSH - NET, 2018 RESULT Redressal of valid objections National Conference on Unani Medicine, 11-12 February, 2019 - REGISTRATION OPEN Walk-in-Interview of engagement of Consultant (Budget) Award Scheme of CCRUM, The last date has been extended to 10 December 2018. CORRIGENDUM regarding advertisement No. 01/2018 published in Employment News dated 10-16 November 2018 for the post of Accountant (Internal Audit).